Spotlight Stories - Posts From May, 2017 - P.R.A.Y. When Justin was earning his God and Family award 8 years ago, his pastor challenged him to find a project that would celebrate Easter. Justin responded with an Easter basket drive that he has called “Easter Goodies from Youth to Youth.” This “one time” God and Family project turned into an annual service project that has lasted 8 years. This year Justin distributed 44 baskets, his biggest year ever. Also this year, Justin completed the God and Life award and received his Four Star recognition for completing all four programs in the P.R.A.Y. series. His award was presented by P.R.A.Y. CEO Jason Noland in March 2017. Daniel Boone Sophomore Coleman P. received the “Programs of Religious Activities with Youth” (PRAY) Four Star Award on April 3, 2017. The P.R.A.Y. Four Star award is a distinguished program requiring extensive application in non-denominational faith learning and serving in the community. With this honor, Coleman joined the ranks of less than 1% of program participants who achieve the full Four Star level recognition, and became the first in Boy Scouts of America Troop 240 (Gray, TN) to have achieved this recognition. 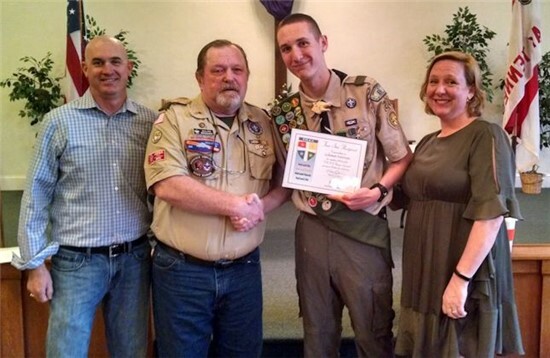 This journey began in his Cub Scout years in the God & Me program (for grades 1-3) and culminated in completion of the God & Life program last fall. Coleman is the son of Chris and Jennifer P. of Gray TN and a Life Scout in Boy Scout Troop 240 of Gray TN. Pictured with Coleman and his parents is his PRAY Religious Advisor and Leader for Troop 240 Allan Bridges.